Last week, on Monday, March 14, students across the nation held a walk out one month after the Parkland, Fla. school shooting. 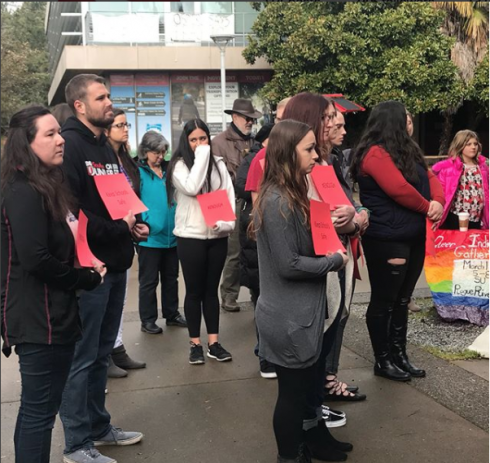 Southern Oregon University (SOU) students from education classes as well as community members participated in the walk out. The group gathered outside the SU to honor and remember the victims of the Majory Stoneman Douglas High School Shooting. 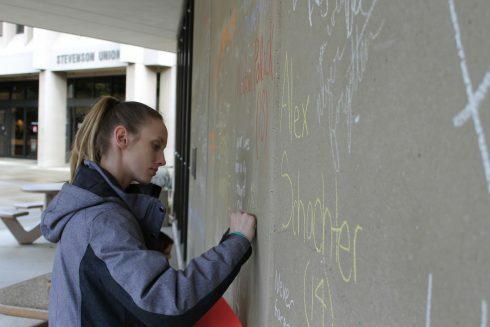 Names of the victims were written in chalk on the wall and seven minutes of silence were had in their honor. 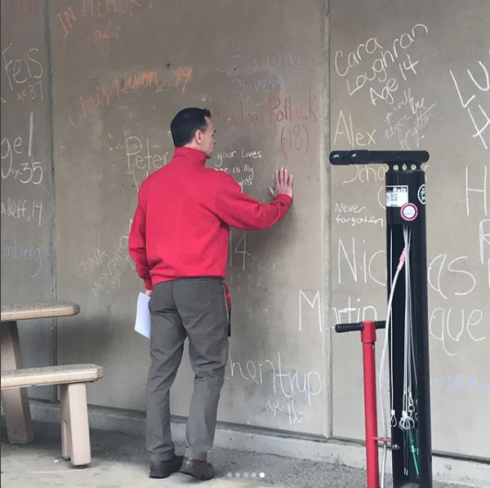 Just two days earlier on March 12, an SOU Timely Warning email went out explaining that Campus Public Safety was notified of a handwritten note found in the bathroom of the science building threatening to bring a weapon to campus. 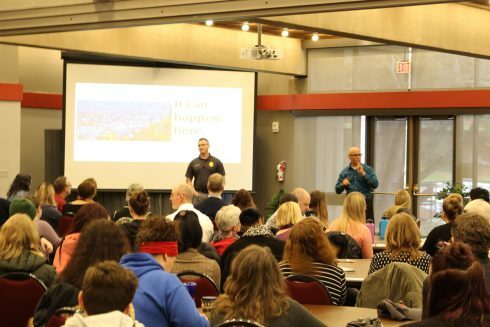 The warning came a week after Southern Oregon University offered an Active Shooter Training conference on Feb. 28 that offered instructions on how to react in a shooter situation. According to Fred Creek, The average law enforcement response time to an active shooter scene is 5- 6 minutes. “5-6 minutes is all you and you have to have the tools to make informed decisions,” he said. He continued, explaining the A.L.I.C.E. Principle which stands for “Alert, Lockdown, Inform, Counter, and Evacuate.” It is used to prevent and lessen casualties of an attack. 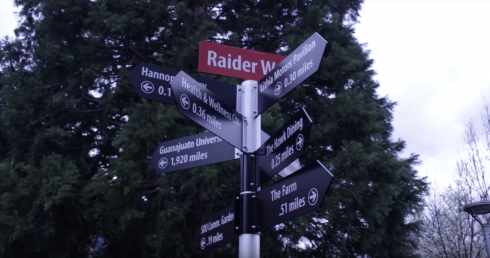 Some students expressed concerns about the resident halls at SOU. While lockdowns for the dorms are relatively easy to do, the dorms are locked from the outside 24/7, some students worry about fire alarms being set off which causes students to leave the safety of their dorms to be attacked outside. In this case, Creek advises students to “…be looking for things out of the norm” during a fire alarm in the dorms. While evacuating, students should take note if they are not seeing smoke or flames or smelling fire, be cautious if it could be a false alarm. While the conference sparked new questions and discussions stating the overall safety of the campus, it was not able to answer all the audience questions. Lily Chub, senior at SOU, wondered why the active training conference was not mandatory for all students. Chub believes that, without the training, other students “…will not be able to answer you about what to do in an active shooting.” She is less worried about what to do in an event of a fire and are more concerned about how to handle being caught in a mass shooting on campus. 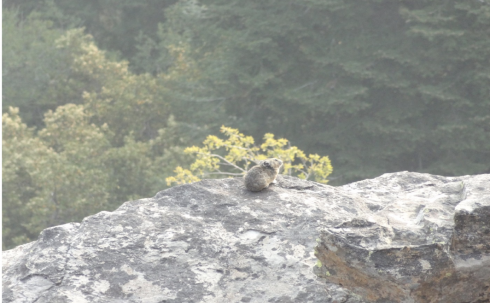 Another intruder training will be held next term on Monday, April 16 in the Rogue River Room from 12:30 to 1:30 p.m. In addition, a wealth of valuable information is available on Campus Public Safety’s Emergency Procedures web page and on the department’s Frequently Asked Questions page. Open forums regarding the “timely warning” notifications and how SOU responds to threats of violence are being held. One was yesterday from 12:30 to 1:30 p.m., and a second will be held following Spring Break, from 7:30 to 8:30 p.m. on Tuesday, April 3, in The Hawk Dining Commons.